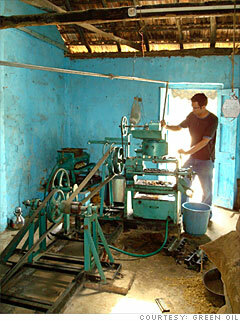 Green Oil co-founder Rahul Ramchandani at a biofuel plant in Alibaug. Concept: Rural India is poised for explosive economic growth, but much of the country lacks access to electricity and affordable fuel. Two students at a top business school in India have developed a plan to decentralize energy sources. Green Oil plans to establish local "bio-fuel centres" to grow plants, collect seeds and extract oil. The oil byproducts would be sold to local residents, helping the remote villages access electricity and become more energy independent. The project hopes to help increase gender equality in rural India by involving women in the seed collection process. There are other social returns to be had as well. An electricity center can be set up for around $4,000, and Green Oil estimates that each can support 60 jobs and generate electricity for 130 households. Co-founder Rahul Ramchandani says working with villagers in western India was enriching but challenged even the most basic assumptions. Management studies in consumer behavior were "inadequate and at times irrelevant," he says. Green Oil couldn't even offer seed collectors a standard price for their harvest, since the unit of weight varied from village to village. The team has participated in business plan competitions in India and Seattle. Sales from a pilot program in the Mahajane Village have been robust, and profits will be directed toward expanding to other villages. Timeline: Green Oil aims to set up 10 biofuel centers by 2010 in the state of Maharashtra.